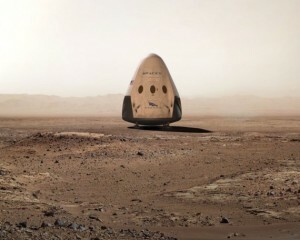 Tesla Motors and SpaceX’s Elon Musk believes he can send a rocket to Mars even sooner than expected. 2018 is the very near future . SpaceX has been working on its human-capable capsule for several years. It is not only bigger than the original cargo-only Dragon capsule, but capable of making planet landings using eight thrusters. The second big challenge will be successfully launching a Falcon Heavy rocket (which is basically just three Falcon 9s strapped together). The company is aiming to get one off the ground sometime this year, but so far has nothing planned. The company has been relatively successful at launching its smaller Falcon 9s without exploding, but the Heavy is, well, heavier. And with three times the engines as the Falcon 9, its way more complicated to fly. Launching a rocket is hard. But it is easy compared to landing a spacecraft on a planet. The red planet’s atmosphere is way too thin, and won’t generate enough drag in the chute to slow it down. Instead, the Dragon 2 will use eight paired SuperDraco boosters to control its descent. Eventually, SpaceX wants to colonize Mars. Elon Musk has promised to reveal more details about the company’s much-anticipated Mars architecture at this year’s International Astronautical Conference, which will be held in Guadalajara, Mexico, from September 26 to 30.